No one would like losing their luggage or misplace the money in a different holiday destination. However, unwanted circumstances do not give a prior warning. In order to avoid the ill-effects of such circumstances, get in touch with Shree Ganesha Tours & Travels. 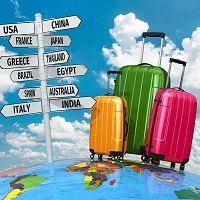 We are based in Bangalore (Karnataka) and offer an affordable service of travel insurance. Choosing an appropriate insurance covers the expenses for mishaps like an accident, robbery, luggage misplacement, and even death. You can also get your packages tailored as per your requirement.